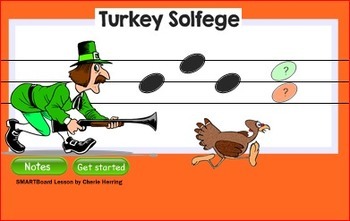 In this SMARTBoard lesson, students touch the hunter to listen to a linked solfege example. 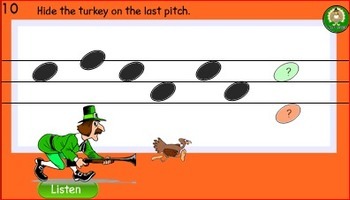 They must decide how the last note moves and put the turkey on top of that pitch. If they are correct, the turkey will be hidden inside the note. If they are incorrect, the turkey will bounce back to the starting spot. This SMARTNotebook lessons uses the Activity builder* widget found in Notebook 11. *SMART is presently working on the Activity builder Add - on and it is not working properly. I have attached a YES or NO response to each possible answer so the students will know how they answered. As soon as the Activity Builder Add-on is repaired, those who have purchased this file will receive an updated version. An audio link/correct response is built into the answer just in case the widget does not work on another type IWB. 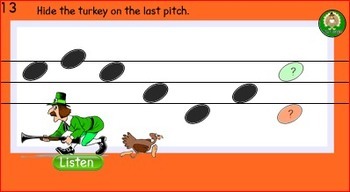 This is a great interactive listening activity for the Thanksgiving season. 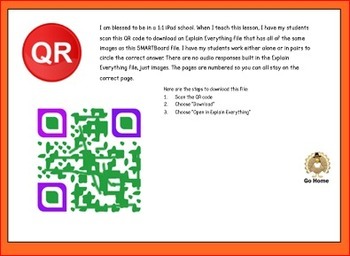 A QR code linked to downloadable Explain Everything file is attached for those with 1:1 iPad classrooms. This is a fun interactive listening activity.